The Yarn Harlot—somewhere (one of her books almost certainly, but likely her blog too)—claims that swatches lie. She is right—well-- somewhat right. It's not so much that swatches lie, as they are loose with the truth. Swatches give lots of information. Some of the information is not always what it seem. Swatching for gauge is often the least useful. Gauge is an elusive characteristic. Gauge can changes with time (we often knit looser (or tighter) as time goes by—and small gauge swatch might not always catch that. The sheer weight of garment can change gauge. At the end of a day (or wearing) a sweater might be looser in the shoulder (stretched out) than it is at the hem. The weight of the yarn in a sweater can pull and stretch and change things. The fiber its self can contribute to these changes... (a silk dress can 'grow' a few inches in wearing.. becoming more form fitting at top and long with each passing minute. (Rayon can do this too.. I have a top that started out a bit snug in the underarm.. and finished the day with the armhole gaping –and almost as deep as a kimono (but since the top didn't have kimono sleeves.. it just looked awful! )It also went from ending just below the waist, to ending well below the hips! Well here is today's swatch. Same stitch as in yesterday's post—but worked in different colors. Not really readily accessible yarns (the multi color is RED HEART-WOOL!) the solid is some newer (3 years old perhaps, not 30 years old) Patons Classic wool. But solids and color ways like this bright version of clown barf are still available--so it is still a useful, in a way. How different the stitch looks in colors that offer high (vs yesterday's low contrast!) It still 'works'--it ends up NOT looking too stripy—and does have a tweed effect. 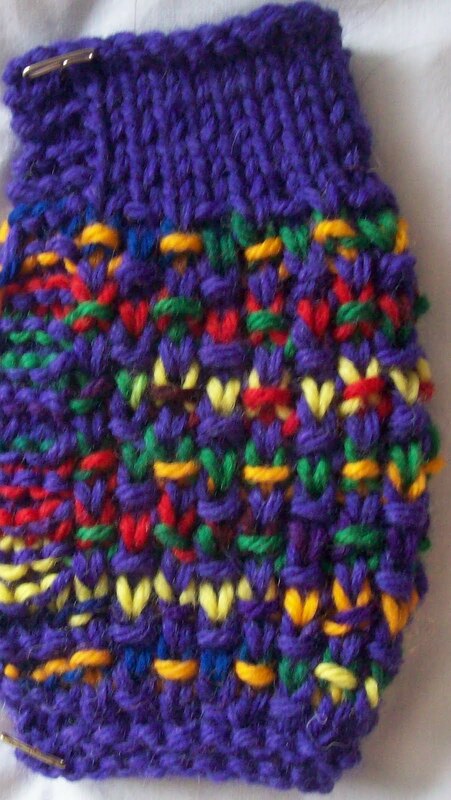 The solid colors tones down the bright multi color.But it also presents very differently, too. 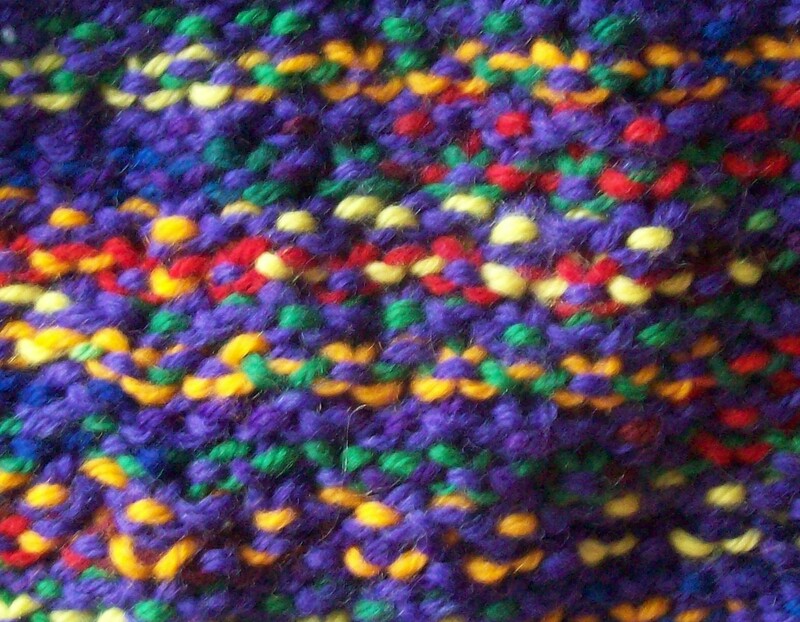 The swatch does more that tell us about how different colors of yarn can change the appearance of the stitch. 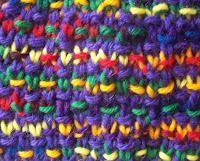 The swatch was knit with worsted on size 7 needles. The top (stocking knit) is a smooth dense fabric. The textured stitch—is very open and almost calls for a size 6/4mm—it definitely would be better knit tighter for a garment of any size (an adult sweater vs say a baby sweater) –or even for a scarf. 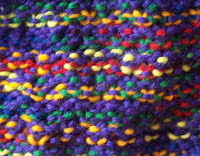 Knit on size 7's(4.5mm) it is a very loose open texture. Folded, it's also clear the stitch has a total different row gauge (than stocking knit). The selvages --the cast on/bind off edges and the side selvages of garter all constrict the swatch—but the problem isn't that the cast on or bind off aren't stretchy—they are. The stitch changed the gauge of the work so much, it just appears so. 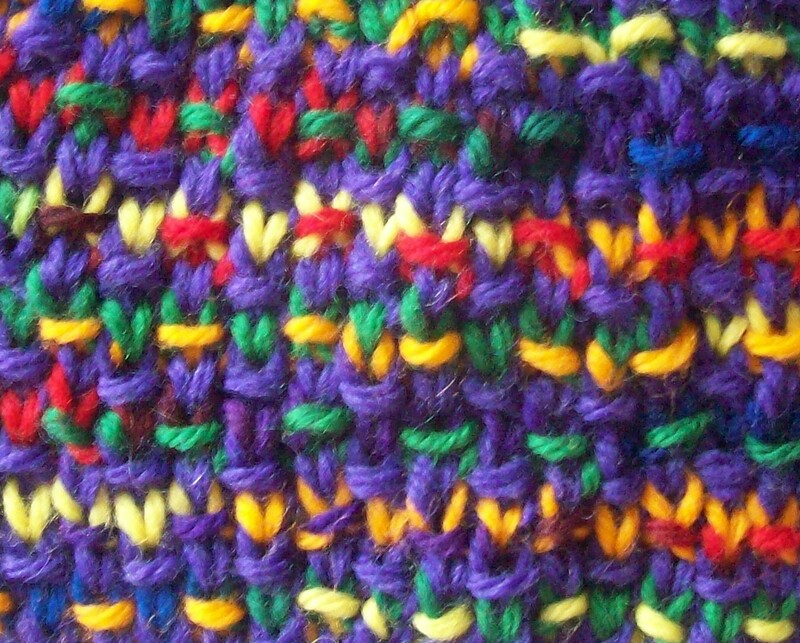 The stitch is more stocking knit that not—and it's not reversible--(not identical or near identical on both sides)—but the reverse side is not uninteresting. I will likely swatch again-- with other colors, other yarns. I think this stitch has 'legs' and can stand on its own with a wide variety of yarns and in a number of different applications. It won't always look the same, but there are some characteristic that transcend the yarn. I can't promise to have more than a sample or two by the end of the week—so I'll be keeping you guessing for a while--That is samples of FO's worked in this stitch, not more sample swatches! This swatch isn't telling the whole truth yet—but with two versions, the truth is a bit closer! Interesting information! Duly noted and filed away for future use. And clown barf always makes me laugh.